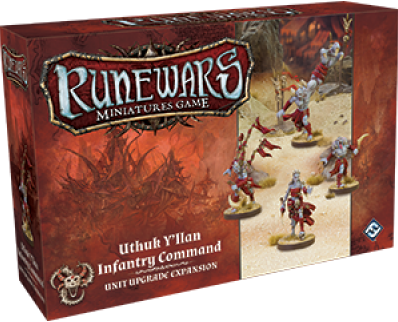 Strengthen your deadly swarm with the Uthuk Y'llan Infantry Command Unit Upgrade Expansion for Runewars Miniatures Game! Customize your forces with the Blood Witch, Shrieker, War Sprinter, and Grotesque. The Uthuk Y'llan Infantry Command Unit Upgrade Expansion includes four new figures and 18 new upgrade cards. Gather your forces from the Ynfernael and conquer Terrinoth! Versterk je dodelijke zwerm met de Uthuk Y'llan Infantry Command Unit Upgrade uitbreiding voor RuneWars het spel! Pas je leger aan met de Blood Witch, Shrieker, War Sprinter en Grotesque. Deze uitbreiding bevat vier nieuwe figuren en 18 nieuwe upgrade kaarten.